San Francisco Salt Company will be sponsoring several National Psoriasis Foundation events this year and sharing information about Dead Sea Salt as a natural alternative to treating psoriasis. 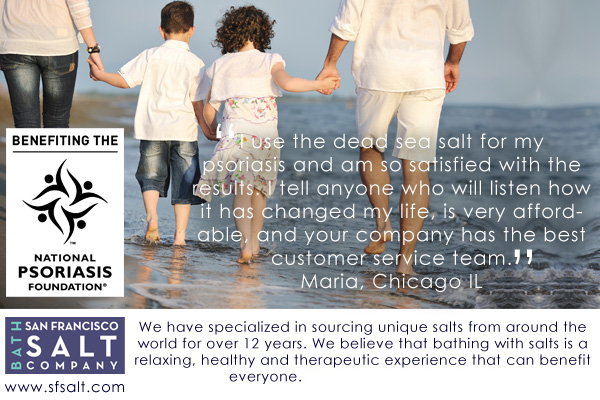 SAN FRANCISCO, April 22, 2015 /PRNewswire/ — One of the country's largest suppliers of authentic Dead Sea Salt, San Francisco Salt Company, is supporting those affected by psoriasis by sponsoring several events hosted by the National Psoriasis Foundation. NPF is a non-profit, voluntary health agency dedicated to curing psoriatic disease and improving the lives of those with the common skin condition. SF Salt provides over one million pounds of their Minera® Dead Sea Salt to customers nationwide each year. Dead Sea Saltbaths are becoming an increasingly known natural alternative in the treatment of psoriasis. The unique sea salt contains a wide variety of beneficial minerals that help hydrate and soften skin, while breaking down the thick plaques that characterize psoriasis. "The sales of Dead Sea Salt by the psoriasis community took us by complete surprise. By mostly word of mouth, the demand for Dead Sea Salt from those suffering from psoriasis has organically taken off and amazed us. I'm personally touched every time we receive a testimonial from a customer stating that our Dead Sea Salt has made a big improvement in managing their psoriasis," says Lee Williamson, owner of San Francisco Salt Company. More Than Skin Deep is being held on Saturday, April 25th in San Mateo at the Hilton Garden Inn. This event is a free educational lecture being held by Dermatologist Dr. Koo. He is a professor and vice chairman of the Department of Dermatology at the University of California San Francisco (UCSF) Medical Center. SF Salt will participate in the event and provide information and samples to participants. SF Salt will also be present at the 2015 Commit to Cure Gala being held on July 25th at the Westin St. Francis in San Francisco. This event will draw in all the major supporters from around the United States to honor Dr. Koo, one of the leading researchers of Psoriasis. On October 3rd, SF Salt will sponsor the Youth Ambassador for the TeamNPF Walk San Francisco. This family friendly event will start at the Justin Herman Plaza where participants will select a 1K or 5K route along the Embarcadero. There will be also be a Health Fair, Kid Zone (also sponsored by SF Salt), music by local bands, and testimonies presented by people thriving with psoriatic disease. Mark your calendars and join SF Salt in supporting the National Psoriasis Foundation by participating in these local Bay Area Events. For more information about Minera Dead Sea Salt visit: //www.sfsalt.com/bulk-dead-sea-salt. SF Salt design, develop, and sell an extensive line of bath and spa soaks to promote relaxation, soothe and care for the skin including Epsom Salt, Dead Sea Salt and Himalayan Salt; as well as a line of gourmet chef salts to guarantee just the right flavor for your dishes.